A few months ago, Vice President Mike Pence took a lot of angry criticism from the left for his policy of not being in situations alone with a woman. Vice President Pence formed his policy from a similar one created by the Reverend Billy Graham. Feminists and liberals were outraged at the time, but Pence is looking like a genius these days for living with this common-sense practice. And although some are arguing that the Pence Practice wouldn't work today, it's pretty clear that what has become the norm over the past 50 years or so isn't working either! Nicholes Fuentes via Flickr, licensed cc. Mike Pence is an Evangelical Protestant, but he was raised Catholic. 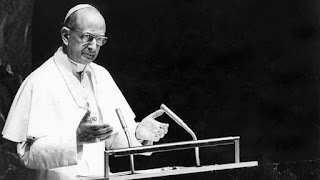 I wonder if some of what formed his views on this might have been Pope Paul VI and his Humane Vitae Encyclical? Back in 1968, The Pope was being pressured to change the church's teaching on artificial contraception. He even assembled a group of lay people and clergy to discuss the issue and give input. This group recommended that the church's teaching be changed. Pope Paul's ultimate decision was to write Humane Vitae. That is indeed what has happened. Women have been deceived into thinking of contraception as "health care." It is expected and almost required for young women in this culture to be sexually active or at least ready for sexual activity and to be on some form of contraception. But instead of empowering women, this type of cultural expectation has stripped them of their feminity and humanity and made it much easier for them to be victimized and abused. Powerful men like Weinstein et al don't think of these women and potential wives and mothers. They are simply a way of achieving some sort of sexual release and exercising a power over them that they have no right to exert. I think it's also funny to note that a few weeks ago the nation was ripping down war monuments and protesting race inequality. This month the statuary is saved, and the war is between the sexes and the classes. The wheel will turn again. Can't imagine what our national focus will be on next. I think this is the best piece you have ever written.